“Fear of Waves.” Oil on Canvas (2015). Katherine Bradford. “Surf Party.” Acrylic on Canvas (2015). “Surfer.” Acrylic on Canvas (2015). 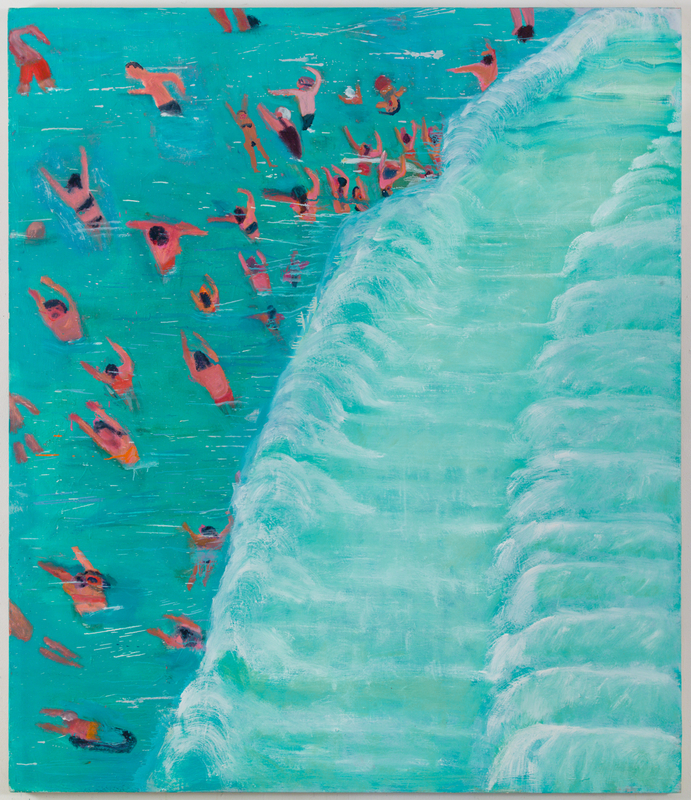 ES: I’ve just come from “Fear of Waves,” an exhibition of your work at CANADA gallery in New York. These new painting are more complex than earlier work, incorporating aspects of “outer space” and on a much larger scale? Would you say a few words on what drew you to this subject matter, initially, and how your treatment of this material has evolved. KB: In the beginning I thought of myself as mark maker and loved the feel of sliding the brush across the canvas horizontally in long strokes. This often had the appearance of water especially water with light bouncing off of it. Because the surface was made using many thin layers of paint it became very inflected and small shapes and glints of light would appear, sometimes suggesting something under water. After awhile I realized maybe I wasn’t an abstract painter, that the fields of color could lead to landscapes and expanses of ocean. What at first looked like blurry forms became small boats and distant swimmers and gradually I intentionalized the subject matter to include outer space and flying supermen. ES: Up close the application of paint is intense, giving the surface appearance of being to well-travelled, even banged up a bit, as though each is some astonishing art work that has been plucked from an attic and just dusted off. Could you tell us a little about your process? KB: Although many viewers see my paintings as pictures, however improbable, what I am mainly after is a mood or tone. I usually stop when the light in the painting becomes interesting, when there’s a feeling of luminosity coming from within the painting. Noctunes appeal to me because there’s a mystery to being out on the open ocean at night and any bit of light, either from stars or phosphorescence provides dramatic contrasts – after all, I’m trying to speak a visual language. ES: There is a climate to the new work that was more of a blank space in the diver series, for example, and even the ocean liners. 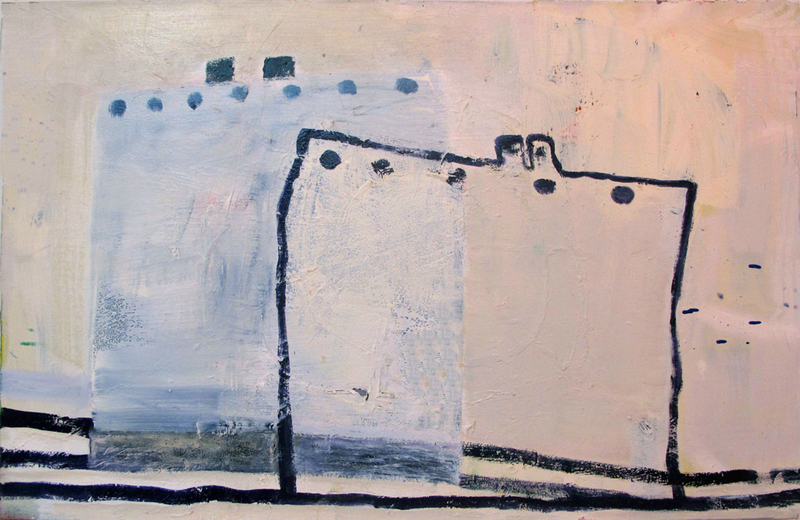 Those works brought to mind Milton Avery, both in the palette and what the unoccupied space suggests. 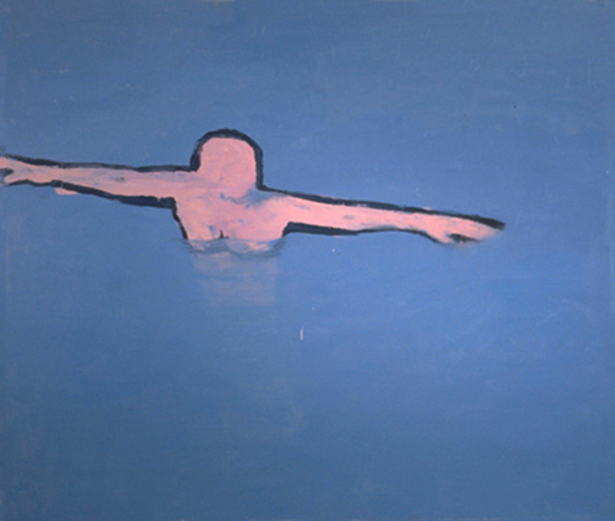 In “Surfer,” and “Fear of Waves,” and other groups of swimmers there seems to be a narrative. Do you have a story in your head when you begin to work? 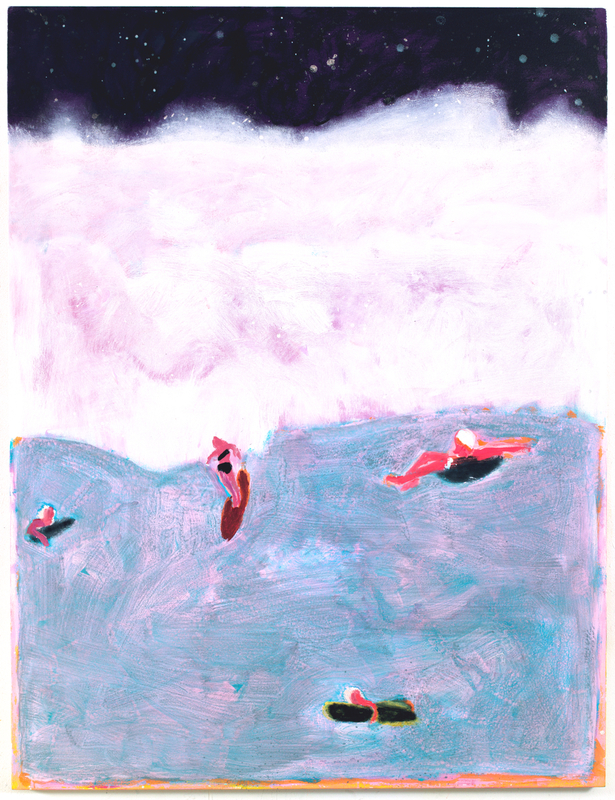 KB: No, I don’t have a story in my head when I work, but you have to consider that I’m making these paintings in a studio surrounded by all my other paintings and often the characters I work with, like divers and soaring super heroes, travel to neighboring paintings in my mind. I move them around and the best things happen when I combine, say, outer space with swimmers because it’s unexpected whereas in my studio they’re all co-existing in one world. As for Milton Avery, I’ve seen paintings of his that move me tremendously; mostly his interpretations of land, sea and sky. I’m not so drawn to his big awkward figures in domestic interiors. 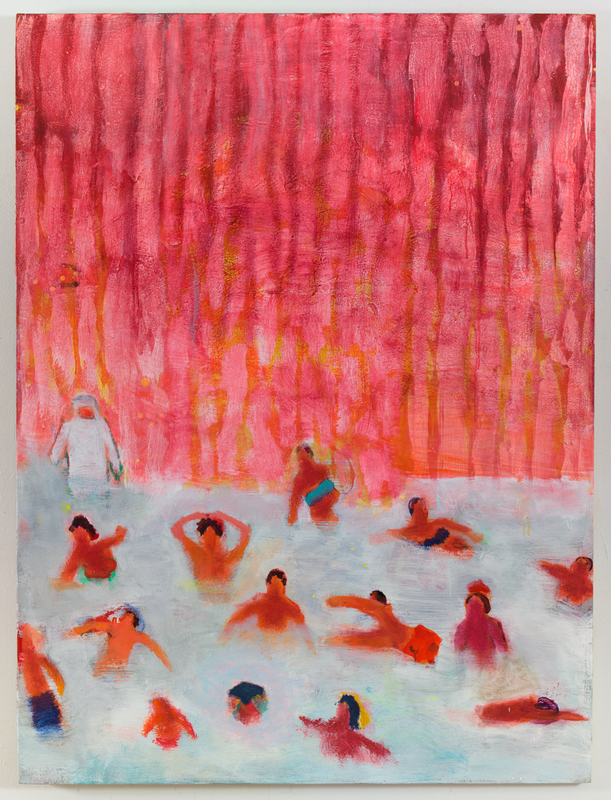 People like Alex Katz, Peter Doig and Daniel Richter have taught me most about how to incorporate people into vast space so it appears like they’re both abstract forms and believable people. 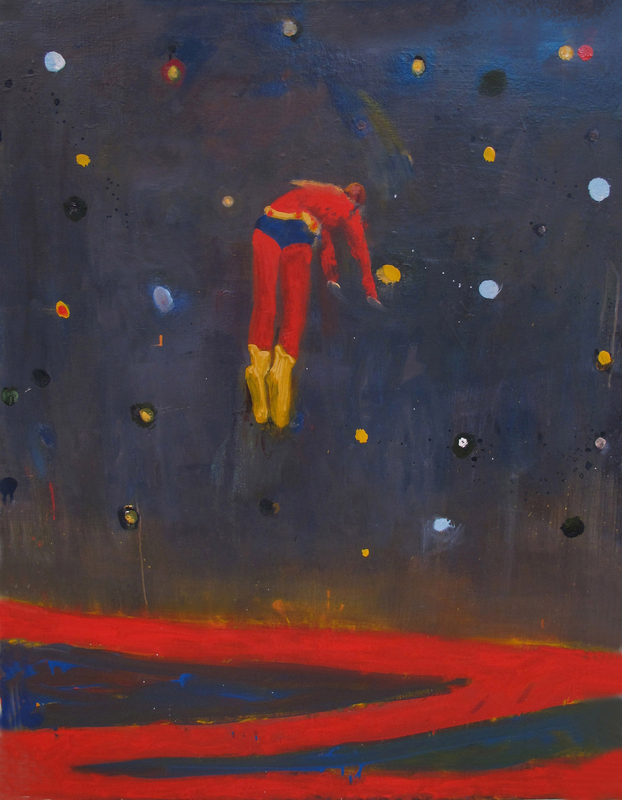 “Superman Responds, Night.” Acrylic on Canvas (2013). “Woman in Water.” Oil on Canvas (2001). 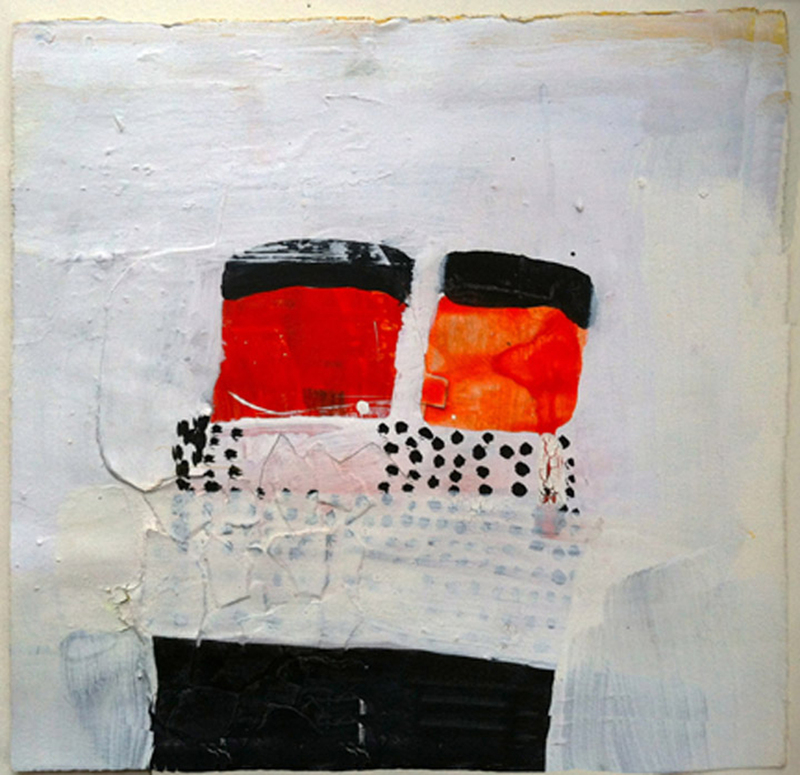 “Liner Collage.” Gouache & Collage on Paper (2012). “Ships Passing, White.” Oil on Canvas (2015). Katherine Bradford is the recipient of numerous awards including a Guggenheim Fellowship, the American Academy of Arts and Letters Award, and grants from the Pollock-Krasner Foundation and the Joan Mitchell Foundation. Some of the work in this portfolio may be seen currently (Jan. 9 – Feb. 14, 2016) at CANADA on the Lower East Side, New York City. Her work has been the subject of several solo exhibitions, most recently at the Fred Giampietro Gallery, New Haven, CT, Arts & Leisure, a Project Space of Freight & Volume, NYC, Adams & Ollman, Portland, OR, Sarah Moody Gallery of Art, University of Alabama, Tuscaloosa, Bowdoin College Museum of Art, Brunswick, ME, Steven Harvey Fine Art, Edward Thorp Gallery, both in New York City. Bradford divides her time working in Maine and New York. For more information on this artist, visit: kathbradford.com and canadanewyork.com.